254 pages | 27 B/W Illus. This book examines the vast and largely uncharted world of cultural/creative city-making in Asia. It explores the establishment of policy models and practices against the backdrop of a globalizing world, and considers the dynamic relationship between powerful actors and resources that impact Asian cities. 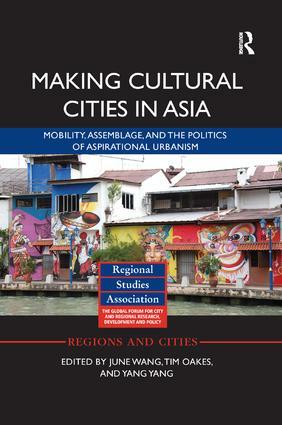 Making Cultural Cities in Asia approaches this dynamic process through the lens of assemblage: how the policy models of cultural/creative cities have been extracted from the flow of ideas, and how re-invented versions have been assembled, territorialized, and exported. This approach reveals a spectrum between globally circulating ideals on the one hand, and the place-based contexts and contingencies on the other. At one end of the spectrum, this book features chapters on policy mobility, in particular the political construction of the "web" of communication and the restructuring or rescaling of the state. At the other end, chapters examine the increasingly fragmented social forces, their changing roles in the process, and their negotiations, alignments, and resistances. This book will be of interest to researchers and policy-makers concerned with cultural and urban studies, creative industries and Asian studies. June Wang is Assistant Professor of Urban Studies in the Department of Public Policy at City University of Hong Kong. Tim Oakes is Professor of Geography and Director of the Center for Asian Studies at the University of Colorado, Boulder, USA. Yang Yang is a PhD candidate at the Department of Geography, University of Colorado, Boulder, USA.